They were all registered to the best Ha image taken on the AG12. Imaged on nights of 9/23/2018, 9/27/2018, 9/28/2018, 9/29/2018, 11/5/2018, 11/6/2018, 11/7/2018, 11/17/2018. 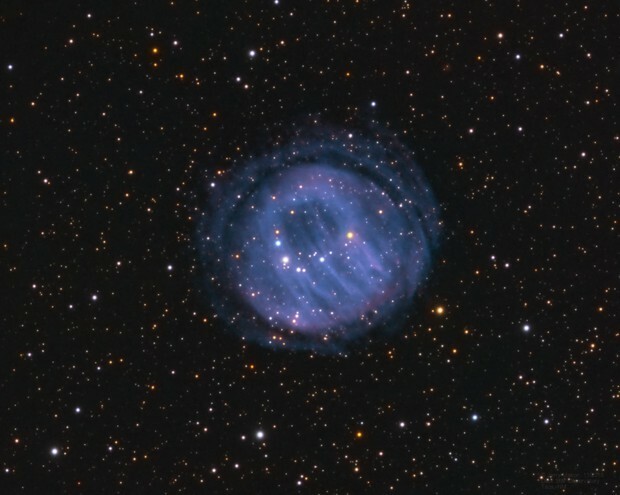 Sharpless 2-200, also known as HDW 2 (Hartl-Dengl-Weinberger 2), commonly called the "Bearclaw nebula", is a quite old planetary nebula (PN) in the constellation Cassiopeia. According to W. A. Weidmann and R. Gamen, who have examined the central stars of different PNs, the central star of HDW 2 is a binary star. This is a very faint PN and requires a lot of imaging time to bring out any detail.